Qatar has asked the United Nations’ aviation agency to intervene in an airspace rights’ dispute with three Gulf states following an escalating diplomatic row and trade blockade, two sources familiar with the matter said on Monday. Qatar has sent a letter to the International Civil Aviation Organization’s (ICAO) governing council in an effort to resolve the dispute after Saudi Arabia, United Arab Emirates and Bahrain closed their airspace to Qatari flights. The Gulf state has indicated that it will ask the council to resolve the conflict, one of the sources said, using a dispute resolution mechanism under the 1944 Chicago Convention which is overseen by ICAO. The sources spoke on condition of anonymity because council business is discussed in private. Saudi Arabia, the United Arab Emirates, Bahrain and Egypt cut diplomatic and transport ties with Qatar a week ago, accusing it of fomenting regional unrest, supporting terrorism and getting too close to Iran, all of which Doha denies. The biggest diplomatic rift in years among the rich states of the Gulf has disrupted Qatar’s imports of food and other materials, although its finance minister has played down the economic toll of the confrontation. It is not yet clear whether the ICAO council, which is holding regularly scheduled meetings in Montreal this week, would agree to intervene, and how long any efforts would take. The matter is expected to be discussed at council by Friday, said one of the sources. “I would not expect any overnight resolutions,” he said. ICAO spokesman William Raillant-Clark said the agency could not make an immediate comment. The UN aviation agency, which is headquartered in Montreal, does not impose binding rules, but wields clout through safety and security standards that are usually followed by its 191-member countries. 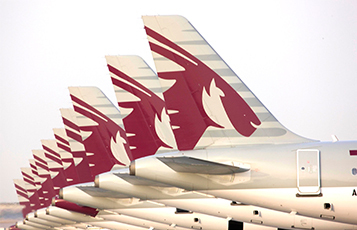 Earlier in the day, the chief executive of Qatar Airways told CNN that ICAO should declare the measures against Qatari air traffic to be illegal. Baker said 18 destinations were now out of bounds for the airline. He also criticised Saudi Arabia and the UAE, both members of ICAO’s governing council, for shutting down the airline’s offices. He added that he was “extremely disappointed” in U.S. President Donald Trump. “(The U.S.) should be the leader trying to break this blockade and not sitting and watching what’s going on and putting fuel on (the) fire,” he said. Trump last week waded into the worst Gulf Arab rift in years and praised the pressure on Qatar, which Saudi Arabia, the UAE and Bahrain accuse of supporting Iran and funding Islamist groups, charges Doha denies.